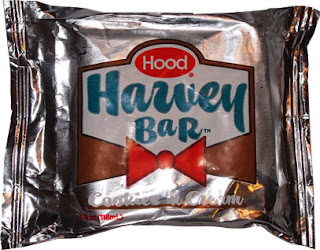 [New for 2013, discontinued] Along with the new greek frozen yogurts they released this year, Hood put out Harvey bars. They're Klondike bar imposters that come in four flavors. There is vanilla, vanilla chip, cookies 'n cream, and then toffee crunch which Nick has already called dibbs on. Foil Wrapper like a klondike, but sealed, but not wrapped. That lack of coating on the bottom is not a good sign. I take my first bite and WOW is this thing disappointing. I expected something decent but no, this one is a flop for me. 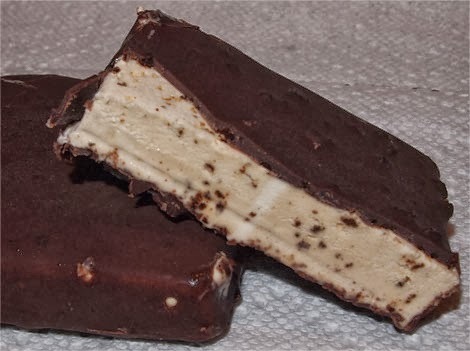 I hate saying stuff like this, because I'm sure someone out there is going "they're great", but why would I eat something with the fat and calories of a Klondike bar yet doesn't even come close to the flavor? I'll wait for Klondikes to go on sale before I buy any more of these cheap impostors. The chocolate is flat as can be, there is barely any flavor to it. I literally pulled off a big chunk of it and started gnawing on it to get some flavor out but it's just not there. Now, add in a sad, low budget cookies and cream filling and we've got a treat that I didn't even bother finishing. I have so many other great treats that either taste much better or have way less saturated fat in them, so why even bother with this tasteless alternative. I'm not going to get the chocolate kick I want, nor do I get my CnC kick, I get nothing. It will fill my tummy, briefly, but not in a good way. On Second Scoop: So I was pretty hard on this treat for the first scoop, and even after a second scoop the most positive thing I can say is "eat this quickly before you notice it's cheapness". I want to like it, but I just can't. The cheap, brittle, low flavored chocolate is just too distracting for my liking. Unless you get a free sample, don't even both with these. @Anon: Market Basket. Maybe Stop & Shop. Not sure if these are being discontinued, but at a minimum, the C&C version is gone.